Jane Little, a bass player in the Atlanta Symphony for 71 years, collapsed at a concert this afternoon. She later died. I pray that her passage was a gentle one: that in her final moments here she felt no pain, only passion burning for her art. I never knew Jane Little, and it feels presumptuous to say too much about her. All I can do is extend my deepest, truest, most heartfelt condolences to her friends, family, and colleagues…and listen to what they have to say about her extraordinary life and career. I have a ticket sitting in will-call at the Minnesota Orchestra box office. I will be over a thousand miles from where Jane Little started, made, and ended her career. But I will enter Orchestra Hall in Minneapolis. The players will come onstage. (The concertmaster will be a woman.) (Her stand partner, too.) And I will see the Minnesota bass section, headed now by Kristen Bruya (principal) and Kate Nettleman (acting associate principal). I will look up to Kristen and Kate as they share a stand. I will watch their eyes fiercely criss-crossing the music, their gazes snapping up intently to follow the conductor. (On Friday, the conductor will be a woman.) They will lose themselves in the sound for us. The bass section is the section that brings the orchestra to life. They will make a mighty rumble. And even though I never met Jane Little, in that moment, I will think of Jane Little. And I will silently thank her, and celebrate the legacy she left for all of us. Here is a profile on Jane Little from the AFM. In case you didn’t know it yet, the Minnesota Orchestra lockout and the Atlanta Symphony lockout are following eerily parallel courses. Some of the Minnesota folks likely aren’t following the ins and outs of the Atlanta story, while some of the Atlanta folks probably don’t know how much of this s*** has been pulled before. So I think it’s time to assess our shared history. The more patrons know, the more powerful we are. First, a disclaimer. A lot of the terrible things the Minnesota Orchestra did during the lockout, they’re not doing anymore. The more inclusive leadership style of new board chair Gordon Sprenger and interim CEO Kevin Smith has been working wonders. Leadership is key. There is still a long way to go to rebuild trust, and any number of things could derail the (rather miraculous) progress made so far. But at least we’re headed in the right direction. I feel that’s an important disclaimer to make, because I have zero interest in rehashing a painful past for no reason. At the same time, I feel it’s important for people to know what happened. So in the interest of bringing the Minnesota and Atlanta communities together, and educating those new to modern orchestral labor disputes, here are ten major similarities between the two lockouts. My longtime readers can doubtless add more in the comment section. 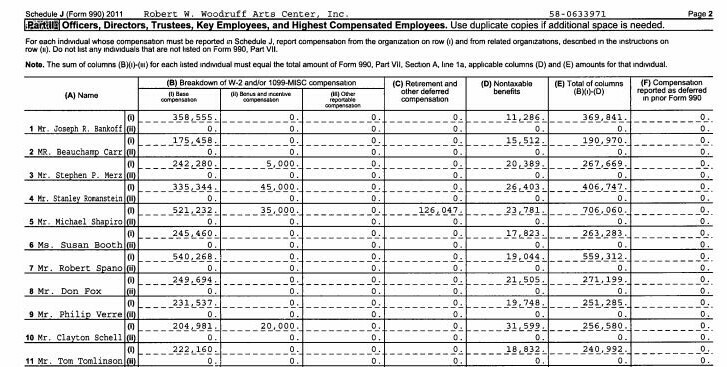 It is becoming increasingly clear that the power players in the Atlanta Symphony lockout are the members of the Woodruff Arts Center (WAC) board. This impression was solidified once former ASO CEO Stanley Romanstein resigned and it was revealed that the interim CEO would have no role in negotiations. Nowadays it’s all Woodruff, all the time. During the upheaval of the past few weeks, I’ve been chatting online with disgruntled Atlanta patrons. Lately we’ve been wondering who the Richard Davis / Jon Campbell equivalent is over at the WAC. Well, good news: We Found Him! Stanley Romanstein’s Massive Bonuses: 2012 Lockout Edition! Another week, another string of Atlanta Symphony Orchestra management fails. In any case, on said slick webpage, management prominently advertises this email address: ASOQuestions@woodruffcenter.org. Implication: if you have ASO Questions…you should write this address. And as you can imagine, I have Questions! As a lover of orchestral music who survived the hell that was the Minnesota Orchestra lockout, I have an acute interest when I see work stoppages at American orchestras. I would like to know when the next Woodruff Arts Center 990 will be coming out, and where I can get copies. I was extremely discouraged to see Dr. Romanstein’s bonus and incentive compensation in past 990s, and I would like to know what kinds of bonuses and incentive compensation Romanstein has received since the first lockout. A friendly word of warning to whoever is manning this address: 2014 is not 2012. As you can imagine, the ASO immediately sent a long email openly and warmly addressing all of my concerns, and we all lived happily ever after. Haha, just kidding. Actually, they never replied, as evidenced by this screenshot. So, having run up against that brick wall, I encouraged some friends to write, too. They sent very innocent, mildly phrased questions about ticket policy in case of concert cancellation, giving no indication they were connected with me. And surprise surprise, none of them ever heard back, either. If you’ve been lucky enough to get a reply from the ASO Questions address, please do say something in the comments. But in the absence of additional evidence, I’m guessing that emails sent here are not being answered – or, at the very least, that a large percentage are not being answered. Which begs the question why the address is there in the first place. ASOQuestions@woodruffcenter.org appears to be the nonprofit equivalent of a false storefront. It actually took an Atlanta Symphony chorus member friend posting on Facebook to clue me in that the document I was looking for – the 990 for the fiscal year spanning June 2012 to May 2013 – has just been posted on guidestar.org. Yep, that’s right: I found the information I was seeking about the Woodruff Arts Center through musician supporters, not the Woodruff Arts Center. I think that might say something. Bonus / incentive pay of $45,000. And remember, this bonus was awarded in the same fiscal year that the ASO locked its players out. I’m gonna be a broken record here, but: bonus or incentive pay for what? Is the Atlanta Symphony Orchestra, in conjunction with the Woodruff Arts Center, incentivizing lockouts, incentivizing failure? One’s inner conspiracy theorist has to wonder, is failure the ultimate goal here? Tear down the existing structure, then build a new one, suited to one’s own peculiar ideological purposes, or to cover up past broader failures, or both…the desires of other stakeholders and the broader community be damned? 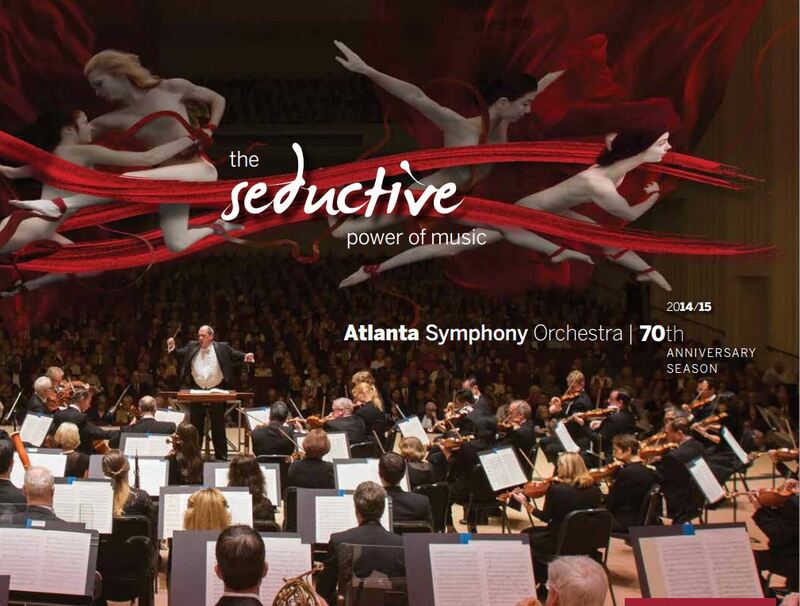 And the Atlanta Symphony Orchestra is advertising this article on its aforementioned slick website! So it’s not like they’re ashamed of their plans or anything. If this kind of crazy raises your hackles, you’re not alone. Save Our Symphony Minnesota [edit: and Save Our Symphony Detroit; a pretty major oversight on my part for not acknowledging them in the original post!! forgive me! – E] have recently welcomed an unofficial sister organization into the world: Save Our Symphony Atlanta. Like them on Facebook here to keep track of their rabble-rousing and explosive growth. In less than a week, they’ve garnered nearly over 7000 supporters on Facebook alone. If it wasn’t obvious before now, it’s now clear: the Atlanta Symphony and the Woodruff Arts Center are now fighting a two-front war: one on their musicians, and another on their patrons. In logical times, you wouldn’t attack your own patrons. But these are not logical times. A gut-wrenching thing is happening to the Atlanta Symphony. And I’m not talking about the second musician lockout in two years, that looks set to deprive the Southeastern United States of great orchestral music for months, if not years, to come. No, I’m talking about the fact that Atlanta Symphony CEO Dr. Stanley Romanstein PHD is being forced to endure people saying negative things about him on the Atlanta Symphony’s Facebook page…simply because he took home obscene bonuses in the years before the first lockout started. But I’m getting ahead of myself. Let’s back up a couple of days. On midnight of the night of September 6-7, the musicians’ contract expired. We really enjoyed having Joshua Bell in Symphony Hall in May. I haven’t spent much time digging into the Atlanta Symphony cluster**** yet because this weekend I was in the Twin Cities celebrating. Thanks to two solid years of hard work by many hundreds of people, combined with copious amounts of luck and an extensive housecleaning at the top of the organization, the Minnesota Orchestra is finally turning a corner. It’s an unqualified miracle. On Saturday I was in the midst of a midnight conversation over ice cream with some dear lockout friends, sitting outdoors under the sparkling moon and laughing, feeling profoundly profoundly grateful for everything, when one of my fellow activist audience members pulled out her phone, checked Facebook, and read the Atlanta Musicians’ press release. We’d all known it was coming, but it didn’t make it any easier. Our smiles faded, and expletives were uttered, loudly. It was the only asterisk of unpleasantness in an otherwise magical weekend of celebration. So I read what I could between parties, and have been trying to get up to speed today. Because I’m invested in this thing – and if you love orchestras, you should be, too. The Atlanta musicians’ fight is our fight, just transplanted to a different city, like some kind of dangerous airborne mold spore, or maybe an STD. As it was in Minnesota, Facebook is turning out to be an invaluable clearinghouse of information that is often more detailed and more valuable than the “he said, she said” summary of events in traditional print media. My friend and Save Our Symphony Minnesota volunteer Elizabeth Erickson advised in a comment to a post on the Atlanta musicians’ Facebook page, “Yes, start digging for financial dirt… Get pro bono lawyers and accountants on board to review 990 tax info; be vocal about what you find…” Yup. And under the Atlanta musicians’ Facebook page, under a link to Kevin Case’s recent excellent article, Kathy Shaw Amos wrote a comment about bonuses. My eyebrows immediately raised. Bonuses to a CEO of a financially troubled orchestra right before a brutal musician lockout? This movie played for a while in Minnesota. And if I’m remembering correctly, it didn’t end well…for the CEO. So I took the, y’know, two minutes it takes to fire up Guidestar.org, download some Woodruff Arts Center documents, and check to see if Kathy Shaw Amos was right. Two minutes I’m assuming the non-blogging media should have, which they apparently don’t. Did nobody learn from Minnesota that the first step is always the 990s? The first step is always the 990s. Check the first one out here, and scroll down to page 40. At the top of the form, you can see that the Woodruff Arts Center fiscal years start on June 1st and end on May 31st. The most recent form available dates from the year extending from 1 June 2011 to 31 May 2012. The Atlanta musicians’ lockout occurred in the autumn of 2012, when ours did. So this is all pre-lockout. 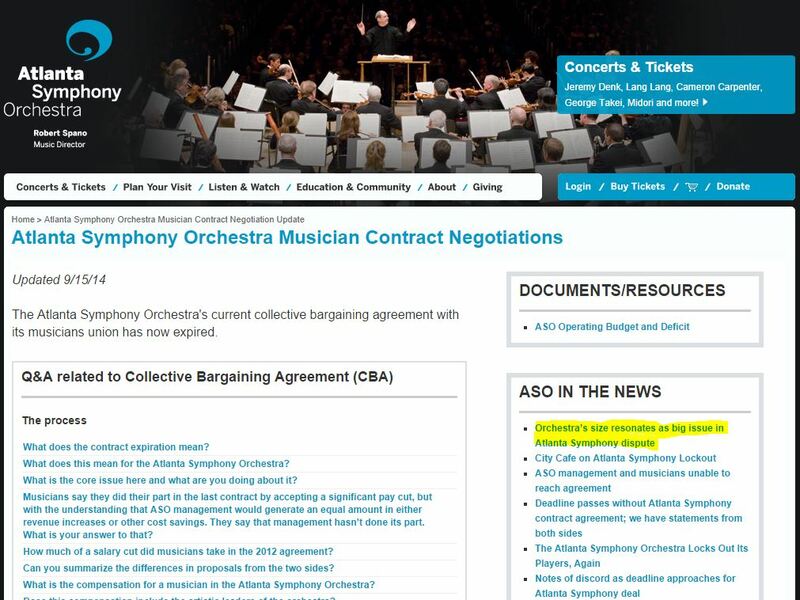 What this says is that Dr. Stanley Romanstein, the Atlanta Symphony President, took home $335,344 in base compensation, with a $45,000 “bonus and incentive” compensation, plus $26,403 in untaxable benefits, bringing his compensation that year to $406,747. That begs the question: bonus and incentive compensation for what? It would be one thing to hand out bonuses to executives who are leading orchestras in good shape, but not ones so fiscally and morally dysfunctional they’re about to lock out the creators of their product. 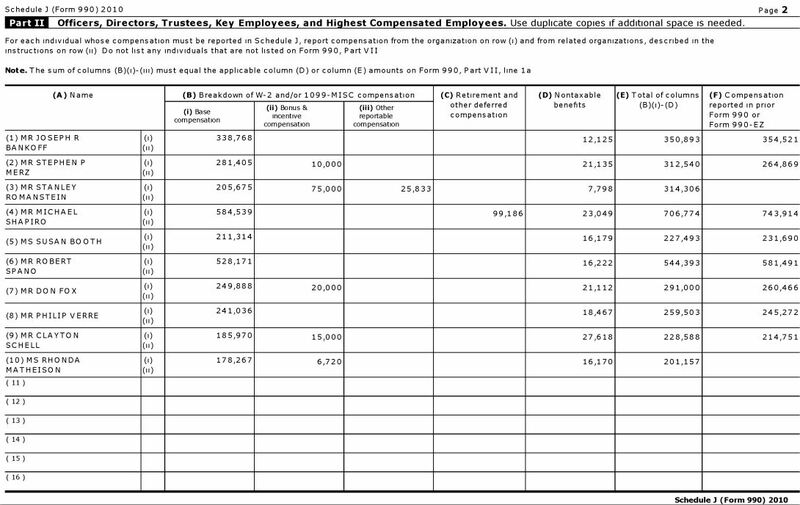 For those of you who are just joining us, I asked similar questions back in October 2013, when I found that former Minnesota Orchestra CEO Michael Henson took home $619,313 in compensation, including two separate $100k bonuses meant for fiscal years 2011 and 2012. This scandal turned into what we in the Minnesota scene ended up calling “Bonusgate.” The Minnesota Orchestral Association tried, but ultimately failed, to suppress community outcry. It was one of the major developments that eroded donors’ trust in Henson so severely that a mere six months later he…..”resigned.” By the end of his tenure, he was unable to attend a Minnesota Orchestra concert without hearing pissed-off patrons yelling before performances, “Fire Henson!” It got to the point where I heard rebellious Minnesota audiences joking about whether or not it was legal to “yell fire Henson in a crowded auditorium.” (Heh.) Is this the kind of impotence that Stanley Romanstein aspires to? Or is he just hoping that Georgian audiences are dumber than Minnesotans? Will these bonuses mean the difference between a deficit and a surplus, between fiscal strength and weakness? Well, no. Do I begrudge these folks their bonuses? Well, not…automatically. But as we saw in Minnesota, where there’s smoke, there’s fire. Bonuses being tossed out so liberally by a non-profit as its orchestra is running massive deficits and contemplating locking out its employees certainly suggests that Hey, Y’Know, There Might Be More To This Story! And troublingly, that “more” might not show up in the 990s. Bonuses in times of financial trouble also bring up legitimate questions about the wisdom of the Woodruff’s and the ASO’s expenditures. Are bonuses for an orchestra CEO really the most responsible use for that particular $45,000? Is giving the CEO bonuses and incentive pay really the best way to advance the mission of the organization? My trust in this leadership team is eroding rapidly. And as we in Minnesota know, when the public can no longer trust a non-profit to wisely carry out its mission, said non-profit is doomed, until its course changes. New business model, old business model, “contemporary operating model”: Minnesota proved that no model can be successful without trust and transparency between all stakeholders. Yes, he was apparently sooo amazing at running an orchestra in crisis that he earned $75,000 in bonus or incentive pay! And then, as the info-mercials say: but wait, there’s more! Yes, back in the pre-Romanstein days, in the fiscal year lasting from 1 June 2009 to 31 May 2010, former Atlanta CEO Allison Vulgamore took home $169,101…in incentive and bonus compensation alone. Her total compensation that year totaled nearly $600,000. Check out page 28. Perhaps this had something to do with the fact her tenure was ending, but…I don’t really care. It’s still a bonus. Paid to a CEO. Leading an orchestra. That was in such dire straits. That a few years later. It purportedly had no other choice. But to lock out its players. Hey, Woodruff, ASO management. As Jon Stewart would say, meet me at camera three. What the HELL, guys? Are you running a non-profit or a shell corporation with an in-house orchestra? What are these bonuses for? Why were they given? How could Stanley Romanstein accept them in good conscience, knowing it was possible – if not likely – that he would be locking out his players in a few months’ time? Does your entire board know about them? Do your audiences know about them? Do your donors know about them? How did these bonuses advance the mission of your organization? What kinds of bonuses are you paying Stanley Romanstein nowadays? As you were preparing for your second lockout in as many years, did you happen to glance to the north and see that these kinds of tactics got the organization nowhere? Are you consciously modeling your strategy after the one that failed so miserably in Minnesota (if so, WHY? ), or are you just so dangerously oblivious you haven’t noticed the similarities? If Stanley Romanstein and the leaders of the ASO and the Woodruff can’t answer these questions, they are not worthy of leading one of this country’s great orchestras. But judging by what they’re saying to the press now, it will likely take the determined long-term hammering of a lot of music lovers before they get the message. Check out the Atlanta Symphony Musicians website, like them on Facebook and follow them on Twitter. Share the news with your friends and family. Just as our fight was theirs, theirs is ours. And as always, follow the money.